Use the map below to compare the concentration of Whole Foods stores (in green shading) with Amazon’s distribution and fulfillment network (use the menu drop-down option to change views). In many ways, this result makes sense. Both Amazon and Whole Foods are concentrated in the country’s major population centers, including California, Texas, New York, Florida, Pennsylvania and New York. The proximity of many Whole Foods stores to existing Amazon locations could be one of the factors that attracted Amazon to the deal — making it easier to integrate its existing delivery infrastructure with its new retail presence. On the other hand, a more complementary geographic pattern might have given Amazon the ability to better serve new areas of the country from existing Whole Foods locations. The companies haven’t detailed their integration plans — the deal won’t be completed until later this year — but it’s easy to imagine possibilities such as an expansion of the AmazonFresh Pickup grocery concept to Whole Foods locations. In a transcript of a town hall meeting with employees, Whole Foods CEO John Mackey made it clear that there will be integrations of Amazon technology into Whole Foods locations, citing the tech giant’s reputation for innovation. “I think we’re gonna get a lot of those innovations in our stores. I think we’re gonna see a lotta technology. I think you’re gonna see Whole Foods Market evolve in leaps and bounds,” he said, according to the transcript. For this analysis, we counted Whole Foods stores, state by state, and matched them up against Amazon’s network of fulfillment centers, sortation facilities and delivery stations, in addition to Amazon Fresh and Pantry hubs, Prime Now Hubs and the growing chain of Amazon Books stores across the country. 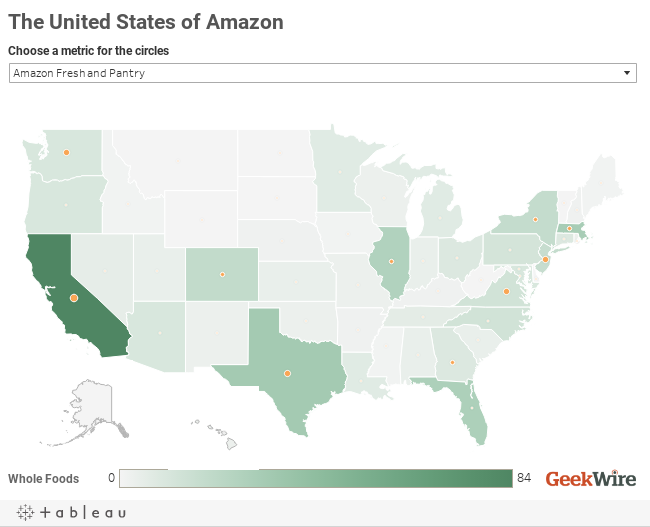 This updated map, created with the help of Tableau Software, builds on our past “United States of Amazon” project, using the latest data from third-party sources such as logistics consultants MWPVL International’s unofficial list of Amazon distribution locations.